Hey, don't forget to visit dufus daze for this week's collection of the best in the week's editorial cartoons - something we call Sunday Funnies. We now return you to our regularly scheduled program. At the foot of Ottawa's National War Memorial which I spoke of on Day 6 is the Tomb of the Unknown Soldier. A 12 by 8 foot granite sarcophagus encloses a coffin which contains his remains. The unidentified soldier was retrieved from a cemetery near Vimy Ridge, the site of a famous Canadian battle of World War I. While Canadian troops successfully beat back the Germans after several days 3,598 Canadians died in the skirmish, including the stranger in the Tomb of the Unknown Soldier. Interestingly enough, the attack was to commence on this day in 1917. Instead, at the request of our French Allies it was postponed for 24 hours. The battle concluded April 12th. Unfortunately "conclusion" held a whole other meaning for our friend above. All around the world, we create these works of art to honor our warriors who quite literally never came home. There are simply no words for the sadness I feel about this and war in general. Very nice entry today (again) Dufus. 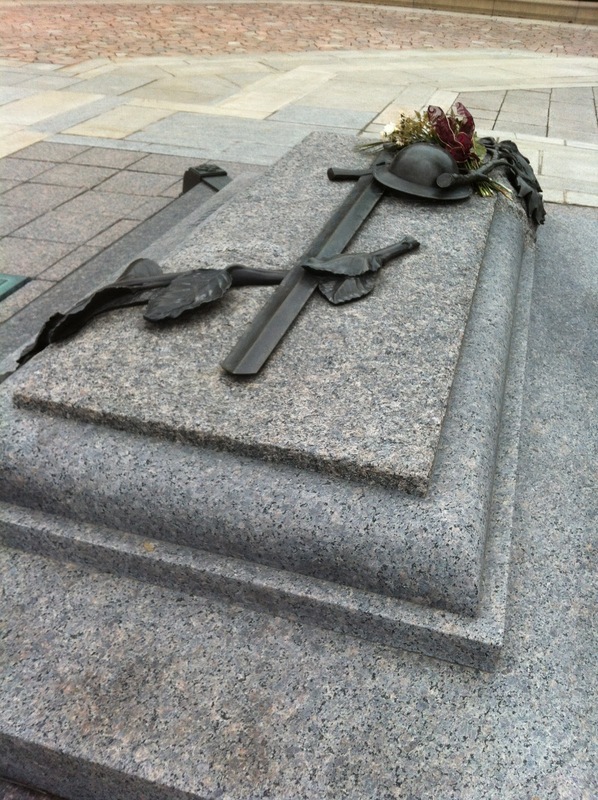 Graves of "unknown" soldiers always make me sad. A shame to have given so much and never made it home to loved ones. At first I thought like Ziva, but then I read what you wrote and understand. A beautiful take, indeed, on today's theme. I love cemeteries and find such charm and history in the populations. I love this "Unknown Soldier" photo and the write up you did. Wonderful! This is a beautiful shot. I saw this memorial on the page that you directed me to and am glad that you chose it for today's theme. Such a gallant use for the word "stranger." And for some strange reason Blanch Dubois infamous line comes to mind: I've always counted of the kindness of strangers. We all have done it without realizing it. Thank-you dear Stranger for fighting for what was and is "right." I thought I might be pushing things doing something similar to Day 6 but the tomb of the unknown soldier cried out for "stranger". I couldn't resist. And kinda apt for Easter. As soon as I saw it at the foot of the war memorial I knew I had my "stranger". Thanks, Ziva. The ironic thing is when I did some research I discovered the Vimy Ridge battle, in which the Unknown Soldier died, was to have actually begun on this day. That kind of freaked me out. Thanks Bryan. Glad you and others like it. And, hey, thanks for the ongoing support and promotion of Sunday Funnies. appreciate it. Thanks, Linda. It helps to know we have such memorials in our cities for a reason. I know. I was kind of getting ahead of myself. But now you have the history of the tomb too. Thanks for that wonderful thought, Quirks. Wow, how incredibly moving. Absolutely moving! I've seen a few "unknown soldier" graves, and always found them stirring. I think because a) feeling unknown is something I relate to and b) perhaps they represent a lot more. You've caught it well too, and the colours, granite and black, strike me more than anything. What a great approach for today's theme and I truly enjoy the historic tidbits that have been accompanying your photos. They compliment each other so well. I've only visited Ottawa once (yeah, I'm a bad Canadian). It was a grade school class trip and we stayed overnight at the Ottawa Jail Hostel but our tour didn't include the Tomb. I can probably now attribute that omission due to the fact we were too young to appreciate the significance of it. As for tomorrow's theme, can I expect a photo of a politician? First, I'd like to point out that I'm not the only one obsessed with death. Second, nice take on today's theme, NoName. I always feel horrible for people who die unknown, unremembered. Great take on today's theme, Dufus. I love that you are kind of doing a theme of your own. Great photo. Great take. Great description. Thanks, Katherine. Sad but important to remember. I think we always want to know who these people are, what their lives were like, how they died and so on. I think the tomb is a recent addition. So it probably wasn't there when you visited. I'm glad you liked the pic. Thanks, Mike. While you can be ghoulish you're still a nice ghoul,mer, guy. I can be like that. Take the path less travelled, you know. Best photo of the day for stranger. You're right. The Tomb was added in 2000. But I always thought there was one - or some type of memorial - due to the fact that Canada's Remembrance Day ceremonies - as far back as I can remember (pun not intended) - have always been conducted on Parliament Hill. Oh, yeah, the actual memorial was completed in the 30s. So it's been there a while. I wonder if anyone has thought of taking a DNA sample and testing it against family types to see if they could identify the Unknown Soldier? It would solve a long-standing mystery, bring closure to a family, and raise interest in our military's history again. Like the others, I'm loving the informational nuggets that go with these photos. That's an excellent idea. I wonder why they haven't thought of it? It's surely cheaper than F-35s. Don't worry. I don't really give a damn, frankly.